(SEJONG=Yonhap News) South Korean companies plan to invest 3.2 trillion won (US$2.8 billion) in 56 infrastructure projects this year, the government said Thursday. The government will also chip in 900 billion won to support the building effort, the Ministry of Economy and Finance said. The projects include a sewage treatment facility in Gumi, about 260 kilometers southeast of Seoul, and a highway linking Pyeongtaek, around 70 kilometers from Seoul, to Iksan, a city about 250 kilometers south of Seoul. Also Thursday, the ministry designated a project to build a K-pop arena in Seoul as a private investment endeavor. The Seoul Metropolitan Government is set to select a consortium in September for the 395 billion-won project in Changdong, northeastern Seoul. The arena project will be fully financed by private companies, according to the ministry. 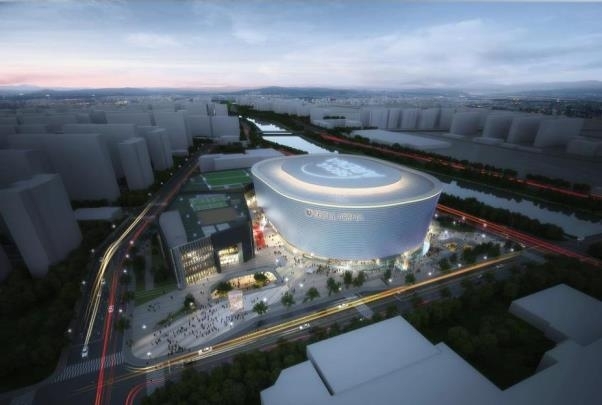 Under a contract, the consortium will build the arena and transfer it to the South Korean government in return for the right to operate the facility for 30 years. The move is part of South Korea's broader effort to attract more foreign tourists and create jobs in the cultural sector. K-pop, which mostly features choreographed dances by boy and girl groups, has gained ground not only in Asia but in the United States, Latin America and Europe in recent years. South Korea sees K-pop and the broader Korean Wave as soft power that can appeal to young people around the world. For many, the Asian country had long been associated with the 1950-53 Korean War and the division of the peninsula into North and South, but now K-pop has made South Korea a cool country -- home to "Gangnam Style," South Korean rapper Psy's mega-hit song, and the seven-member K-pop sensation BTS. Experts said the Korean Wave generated by K-pop and dramas could turn fans in foreign countries into active consumers of South Korean products.